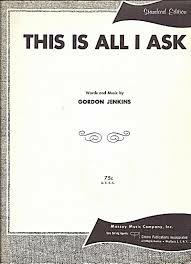 Gordon Jenkins was a prolific composer, arranger and conductor from the 1930s through the 1960s. He worked closely with artists including Frank Sinatra and Judy Garland. Jenkins won a Grammy Award for Sinatra’s 1965 album September of My Years, which included a recording of This Is All I Ask. Jenkins is said to have considered this song his favorite of all the songs he wrote. This song was recorded on March 1, 1960 and released in 1960 on Alone Together. “This Is All I Ask” was recorded on April 26, 1963 and released in 1963 on the album This Is All I Ask. It was arranged by Ralph Burns. “This Is All I Ask” with Josh Grobin was recorded in 2011 and was released that year on Duets II. It was arranged by Jorge Calandrelli.